Puppycat Goes to the Doggy Doctor! I know it’s hard to believe, but one of my favorite things to do is binge watch trashy TV on Netflix and snuggle with Puppycat. The other night when I was binging and watching Skin Wars, I was petting Puppycat and felt a lump on her side. Immediately my stomach dropped! Gracie had been 8 when she died and Puppycat just turned 7 in October. Of course I also felt the lump on a Sunday, I started my new job Monday and didn’t knwo if I’d have time to call the vet while orienting or not and I didn’t even know for sure what time it was going to be done, so I didn’t know if I’d be able to call after either. I ended up being done around 3:30 Monday and on my way to my car, I called and got her an appointment for today at 1:30 in the afternoon. While I didn’t really want to wait too long, that was the soonest that I could get in, so I just went with it. This morning, Puppycat was thrilled to take a bath–NOT! Once I get her in the shower, she’s fine, but you can tell that she just dreads it horrible. As soon as I take her collar off for anything, she cowers to the floor and literally won’t move. If Jason is in the house, she will run to him and won’t leave his side because he lets her do whatever she wants. After her bath, she spent a bit of time relaxing on the couch. Isn’t she just the prettiest? We ended up leaving a bit early so that I could stop at the grocery store quick. 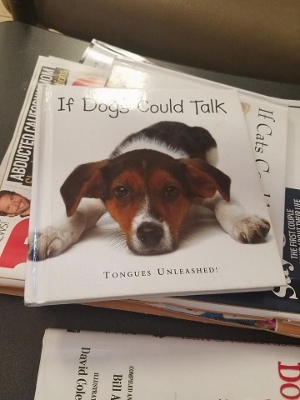 We ended up at the vet early and I found this qute little book in the waiting area. It’s super cute! We got in pretty quick and as I expected the vet things that it’s just a fatty lump. She said that as dogs age, they become more common. She offered to biopsy it and send it out to make sure and I took her up on that. Sometimes $50.00 is worth a piece of mind! 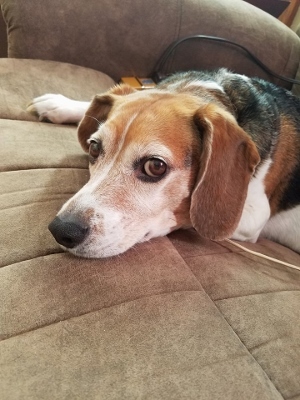 Hopefully the results will be back in on Monday or Tuesday, so I’m hoping that it’s negative for cancer, but if it is, we’ll deal with that when we know. She also said that if she gets any lumps that show up and grow quickly, the lumps aren’t moveable, and if there’s an ulceration or hairloss around the area, it would likely be something worse, but at this time, it looks like nothing big. Puppy dealt with it like a champ of course. Here she is waiting for Dr. Sarah to come back in and do the biopsy. She was actually really good throughout the whole trip! She jumped a bit when they actually did the biopsy, but that seems like a reasonable reaction. 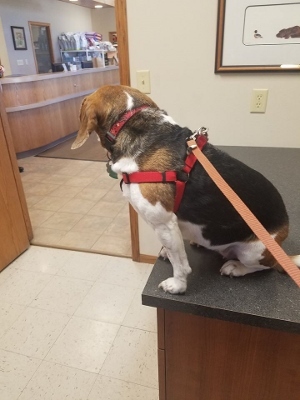 After the procedure, she showed off while getting her treats and showed them how good she can beg, sit, and dance! Once we got home I gave her a slice of bologna. She’s been sleeping on the couch since, which is pretty normal for her. So if you woudln’t mind, sending a few prayers or well wishes our way would be great. I’m off to make birthday supper for Jason as today is his birthday! He’s spent the day farming and I had to remind him he needs to be in a bit earlier as I need to be in bed by 10 cause I have to work tomorrow. I found a recipe for a peanut butter dessert that I’m going to try! Stay tuned cause I’ll be sharing it! This entry was posted in Uncategorized on February 1, 2017 by Kelli. I’ll say a prayer for Puppycat! My stepDad is having a biopsy on M too. No fun. Happy Birthday to Jason. Farmers are special people! Praying for good results. Happy Birthday to Jason. Scary times! I’ll add her to my prayer journal! Hope all will be well! Let us know how she is! Gosh, it’s hard when our furred friends have health issues. Here’s hoping a little “lipo” is all that PuppyCat needs and there’s quick healing. Sending prayers for Puppycat! Hope she gets good results. Happy birthday to Jason! Hope all goes well with Puppycat and Jason’s B’day dinner. Good thoughts! You bet I’ll pray for the news to be good! My cat, Freya ( also 7 years old) , had a malignant tumor removed in December. The vet says it was self contained and seems to feel the future is positive, but everything I’ve read on-line about this kind of tumor in cats….. well, it doesn’t seem to good. Prayers for Puppy-cat! I have another cat that my husband calls “puppy cat”, because she follows me everywhere! Prayers for Puppycat! Our fur babies are so important to us. We lost one of our dogs last summer and the other isn’t doing real well so I know. Be sure to let us know what you learn! Hope all goes well for Puppycat.